In today’s digital age, organizations must continue to modernize their enterprise applications in order to maintain a competitive advantage in the market. Surprisingly, when it comes to managing fundamental business practices, such as planning, budgeting and forecasting, many enterprises still use spreadsheets or legacy on-premise solutions to manage their day-to-day operations. These spreadsheets or legacy systems quickly become outdated, are prone to errors, expensive to maintain and do not provide the level of confidence and accuracy needed to plan for profitable growth. In such a scenario, business leaders need an enterprise application to streamline these processes to increase revenue and lower operating costs. With a focus to help organizations overcome these operational challenges, Linium offers pre-packaged, rapid deployable planning and budgeting and business intelligence cloud-based solutions. The company enables financial transparency and visibility to key business drivers; eliminating manual data entry and syncing budgeting with overall corporate strategy. “At Linium we help companies become lean in technology while positioning them to achieve enterprise scale and grow confidently. By solving operational challenges, our clients can focus on innovation and most importantly, increasing revenue,” says Joe Burke, CEO, Linium. Linium leverages world-class enterprise platforms, such as Oracle, as the foundation to provide its clients with solutions that enable its clients the capability for customizable mission-critical applications on scalable platforms. The company uses the mentality of making technology work for its clients, not the other way around. Rather than just tackling projects, Linium helps clients solve real business challenges to confidently achieve enterprise scale by leveraging the best in people, process and technology. Linium differentiates itself by its customer experience based approach, proven processes and industry best practices. 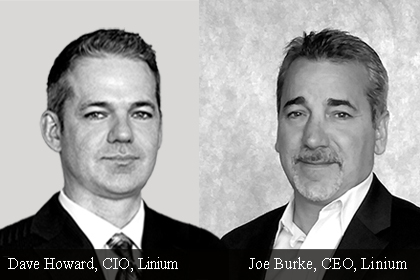 “We focus on delivering solutions and strategies that enable our clients to operate better, faster and cheaper,” states Dave Howard, CIO, Linium. “We provide lower time-to-value, while allowing clients to focus on what's most important in running the business,” he adds. For instance, The H. J. Heinz Company, one of the largest manufacturers of consumer products in the world with over 30,000 employees, was utilizing a manual excel-based product that was very cumbersome and inefficient. By leveraging Linium’s pre-packaged planning and budgeting cloud-based solution, the company was able to quickly deploy a web-based product to centralize its planning and budgeting efforts. The client instantly saved time on planning and budgeting basics, such as the roll-up of financial data and a streamlined reporting process. Linium continues to focus on helping organizations run better, faster, cheaper by solving operational challenges. “We continue to develop strategies and solutions that are based on customer centricity and delivering the best possible results across the entire enterprise,” concludes Burke.